oftwominds-Charles Hugh Smith: Have We Reached Peak NFL? How will the owners and managers of the multi-billion-dollar NFL empire handle the league's decline phase? OK, I get it: pro football is so popular because it's one of the last refuges of modern life that hasn't been ruined by politics. Oops, scratch that. But we shouldn't pin the decline of pro football's popularity (as measured by viewership) solely on player protests, as the decline predates the recent politicization. Even more troubling for the multi-billion-dollar NFL empire, the youth demographic is evaporating like mist in a scorching summer day in Death Valley. 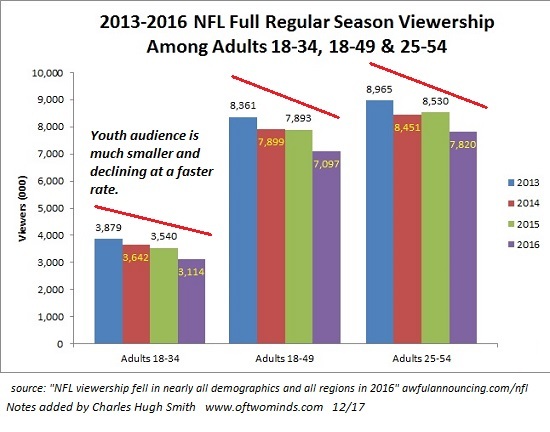 The problem for the NFL is two-fold: the number of young people who are dedicated NFL viewers is modest, and even worse, it's declining at a fast clip. I am sure there are plenty of 25-year old fans, but anecdotally, I don't know a single Millennial who has any interest in sitting through a 2-hour pro football game at home, or ponying up the big bucks and huge chunk of time required to attend a game. Again, anecdotally, young people seem more likely to watch a short clip of the game's highlights on Youtube than devote 2+ hours to sitting through endless annoying TV adverts for a few moments of action. Or they're investing their sports-related time and money in college or local sports; if they're parents, their time may be devoted to their kids' sports activities. In other words, pro football is an interest of the older generations that isn't shared by the younger generations. We can chart this progression with an S-curve, which in the case of the NFL, is marked by the "boost phase" of viewership in the 1970s and 1980s as Monday Night Football expanded the TV audience and the league added franchises. The league reached a maximum audience some years ago, and has now entered the decline phase. But the NFL's troubles run even deeper than demographics: its fan base is being pressured financially while the cost of attending a game keeps rising.Anecdotally, attending a game costs a small fortune now. Yes, there may be a few cheap seats in the nose-bleed sections, but the costs of getting to the game, parking and refreshments far exceed what attendance cost the previous generation, even adjusting for inflation. Maybe somebody feels $10 for a beer in a tiny plastic cup suitable for a urine sample and $20 (or more) for a couple of hot dogs or snacks is a fair price, but outside the circle of dedicated fans, it's a ripoff. 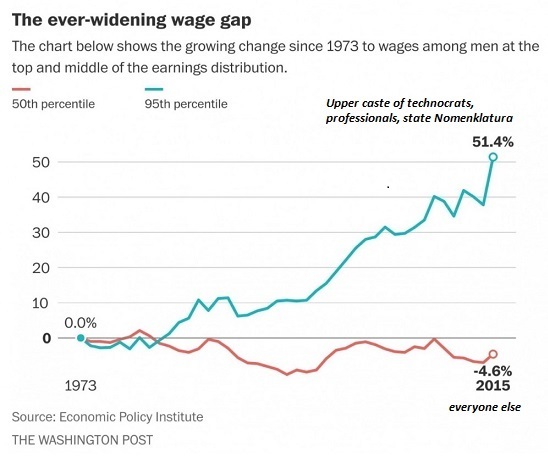 Just in case the NFL didn't notice, 95% of the populace is experiencing stagnating wages and rising costs of essentials, leaving less and less to blow on luxuries such as NFL games. Only the top 5% have the dough to blow on luxuries, and not to put too fine a point on it, but outside of the luxury corporate boxes, the top 5% is not the prime NFL audience for several reasons, including that they're too busy working and taking care of responsibilities to devote precious spare time to watching pro football. 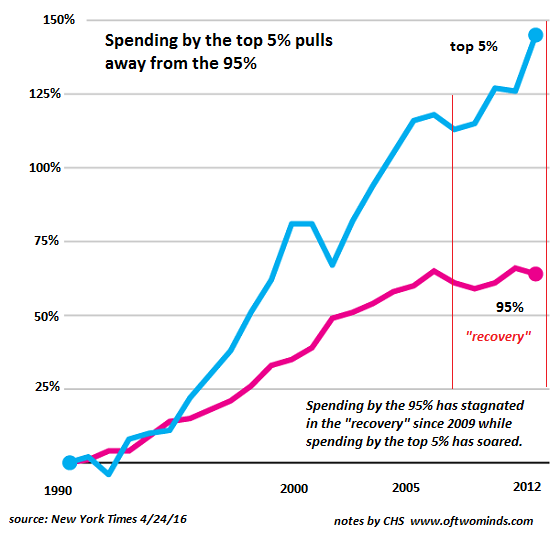 Spending is correlated to income, naturally enough: most of the "recovery" is the result of soaring discretionary spending by the top 5%, not the modest spending that is affordable to the bottom 95%. That means that the advertisers spending big bucks to advertise on NFL TV games are reaching an audience with diminishing cash or credit to spend. Lastly, the NFL has reached the point of over-saturation. Monday Night Football was an innovation in 1970, but who has time or interest for Thursday morning football, Friday afternoon football, etc.? Then there's the health-related issues (brain damage suffered by players) and the politicization. 1. The NFL has saturated the potential audience to the point of exhaustion. 2. The potential audience is shrinking as student-loan-burdened Millennials have collectively little interest in spending the money or time required to be a rabid fan of pro football. 3. The cost of attending an NFL game is increasingly out of reach of the bottom 95% of households. 4. TV viewership is declining across the entire demographic spectrum. 5. The wages/income of the vast majority of the TV audience has stagnated, and 95% of the populace has less disposable income than a generation ago. 6. The top 5% with the majority of the disposable income are not big pro sports fans, mostly due to the many demands on their time and the diversity of other pursuits available to them. How will the owners and managers of the multi-billion-dollar NFL empire handle the league's decline phase? 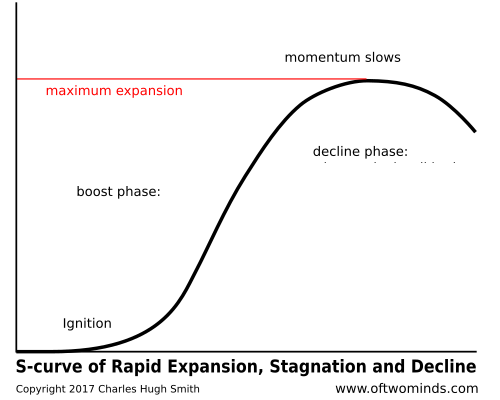 Managing the decline phase is less fun than reveling in the expansion phase. Thank you, Matthew R. ($5/month), for your monstrously generous pledge to this site-- I am greatly honored by your support and readership.